Boehner praised President Barack Obama's address before the joint session of Congress, which dealt mainly with the non-controversial topics of better health care and education while cutting earmarks and wasteful spending. "With few exceptions, it was a speech I could have given," Boehner said, joking that he probably couldn't have delivered it quite as well. "It was a very conservative speech. Very few parts that I disagreed with." Ahh, yes.. if you can't beat 'em, pretend like they've joined you. The Japanese and U.S. crises differ in many ways, but the starkest contrast is in the response of policymakers. Denial, dithering, and delay were the hallmarks in Tokyo. It took the Bank of Japan nearly nine years to bring the overnight interest rate from its 1991 peak of eight percent down to zero. The U.S. Federal Reserve did that within 16 months of declaring a financial emergency, which it did in August 2007. It has also applied all sorts of unconventional measures to keep credit from drying up. It took Tokyo eight years to use public money to recapitalize the banks; Washington began to do so in less than a year. Worse yet, Tokyo used government money to help the banks keep lending to insolvent borrowers; U.S. banks have been rapidly writing off their bad debt. Although Tokyo did eventually apply many fiscal stimulus measures, it did so too late and too erratically to have a sufficient impact. The U.S. government, by contrast, has already applied fiscal stimulus, and the Obama administration is proposing a multiyear program totaling as much as five to six percent of U.S. GDP. When it comes to crisis management, it is far better to do too much than too little. The choice of Bretton Woods as the location then was partly a concession to the failing health of John Maynard Keynes — the most renowned economist of the 20th century and Britain’s chief representative — in an era before air-conditioning. Keynes had a bad heart and pleaded with Harry Dexter White, the United States Treasury economist with whom he was making the plans, not to “take us to Washington in July, which should surely be a most unfriendly act,” according to Keynes’s biographer, Robert Skidelsky. State Department officials lobbied for a resort in Indiana, but Henry Morgenthau, the Treasury secretary, directed White: “Have it in Maine or New Hampshire, some place up in the mountains there.” The fact that State Route 302, which runs through the basin, could easily be sealed for security is thought to have played a role in the decision, too, along with President Franklin D. Roosevelt’s friendship with Senator Charles Tobey of New Hampshire. for the Treasury's efforts, at Calculated Risk. Check it out! The AP reports: Animal spirits, indeed. HT: Michael Crowley. We could use some of these: From Piled Higher and Deeper, where there's more. [T]he shock to the world of finance has been echoed by a shock to the world of academic economics that is just as profound. First there is the cash.... most high ranked economics departments have professors earning in excess of $300,000. Not much by the pornographic standards of finance, but a fat paycheck compared to your average English or Physics professor. The technical demands helped limit the supply of economists. But what drove demand was the unquenchable thirst for economists by banks, government agencies, and business schools - the Feds, the Treasury, the IMF, the World Bank, the ECB. Economics had powerful insights to offer the world, insights worth a lot of treasure. Economics was powerful voodoo. Any major university or research institute wanted to arm itself with this potency. Well, 73 years... but it is striking how much of the discussion of our current troubles revolves around the textbook Keynesian framework we teach our principles students. While that raises the question of what, exactly, we've been doing since the General Theory (and why anyone is paying us to do it), I'm not convinced its entirely a bad thing for us economists. Introductory economics is, to a large extent, our public face - far more people take intro economics than read academic journals. While Clark may be right that this crisis provokes doubt about the value of some of our research, outside the profession we are not judged by the contents of Econometrica. So, I'm not as gloomy as Clark about the demand for our services, but I do think some self-criticism is in order. Another striking feature of the crisis has been that we find ourselves talking about Keynes more than ever, and names like Irving Fisher and Frank Knight are popping up with increasing frequency. One salutary outcome of this bout of navel-gazing would be more attention to the history of economic thought, which I have urged previously. Japanese Finance Minister Shoichi Nakagawa said Tuesday that he will resign from his post after passage of various budget bills. Takeo Kawamura, chief cabinet secretary, said at a news conference he understood Mr. Nakagawa's behavior was caused by taking too much cold medicine. But he added: "It wouldn't be true if we said he didn't drink any alcohol." [Fisher] described debt deflation as a sequence of distress-selling, falling asset prices, rising real interest rates, more distress-selling, falling velocity, declining net worth, rising bankruptcies, bank runs, curtailment of credit, dumping of assets by banks, growing distrust and hoarding. So, is the "Minsky Moment" to be followed by an "Irving Fisher Interlude"? We can count on Ben Bernanke, whose own academic work on the "financial accelerator" follows in Fisher's footsteps, to continue to use all the tools he has - and all that he can dream up - to make sure it isn't. Update: Krugman is also thinking about Fisher. The conventional view of China is one of a country undergoing a continual process of "reform" and economic growth. I've just read Yasheng Huang's new book, "Capitalism With Chinese Characteristics," which is a useful corrective to the standard picture. Huang argues that China's growth in the 1980s was based on liberalization which allowed entrepreneurial capitalism to develop in rural areas. In the 1990s, however, China turned in the direction of state-directed urban-biased development. While GDP has continued to grow impressively, living standards have lagged (for example, illiteracy has risen). 1990s China was less favorable to private business, and much more prone to corruption. Huang argues that China's development path has taken a turn more akin to Latin America than the East Asian success stories like South Korea. Being urban in this book does not just refer to a geographic characteristic; it is also an ideology. At the political and economic levels, urban China represents the strong hand of the state, a heavy interventionist approach toward economic development, an industrial policy mentality, and an aversion to the messy and often unsightly processes of a free market and low-tech entrepreneurial activities.... Rural entrepreneurship reflects the extent of urban controls. It thrives when urban controls are loose and it languishes when urban controls are tight. Shanghai is the consummate urban China in the sense that it has almost completely emaciated its rural entrepreneurship. The most important implication from an Indian miracle in the making is the importance of what I call "soft infrastructures" to understand economic growth. Soft infrastructures, such as rule of law, financial institutions, and China's directional liberalism in the 1980s, matter more for growth than the massive investments in hard infrastructures. Here is The Economist's review. Headline in the Washington Post: and yet, we learn just below, it may not be enough. The (sketch of a) plan unveiled by Treasury Secretary Geithner last week left many unimpressed. The main line of criticism is that many of the large banks are insolvent, if their assets are valued at market prices, and that the US should bite the bullet now with a more decisive intervention (e.g., nationalization). Failure to do so means that the economy will be burdened, Japanese-style, by a "zombie" banking sector that does not supply the credit the economy needs. There are two countries who have gone through some big financial crises over the last decade or two. One was Japan, which never really acknowledged the scale and magnitude of the problems in their banking system and that resulted in what's called "The Lost Decade." They kept on trying to paper over the problems. The markets sort of stayed up because the Japanese government kept on pumping money in. But, eventually, nothing happened and they didn't see any growth whatsoever. Sweden, on the other hand, had a problem like this. They took over the banks, nationalized them, got rid of the bad assets, resold the banks and, a couple years later, they were going again. So you'd think looking at it, Sweden looks like a good model. Here's the problem; Sweden had like five banks. [LAUGHS] We've got thousands of banks. You know, the scale of the U.S. economy and the capital markets are so vast and the problems in terms of managing and overseeing anything of that scale, I think, would -- our assessment was that it wouldn't make sense. And we also have different traditions in this country. Matthew Richardson and Nouriel Roubini make the case for nationalization in a Washington Post op-ed, concluding: "We have used all our bullets, and the boogeyman is still coming. Let's pull out the bazooka and be done with it." At Naked Capitalism, Yves Smith has scathing assessment of Geithner's plan (Mussolini, really?!). Raghuram G. Rajan, a professor of finance and an economist at the University of Chicago graduate business school, draws the distinction between “liquidation values” and those of calmer times, or “going concern values.” In a troubled time for banks, Mr. Rajan said, analysts are constantly scrutinizing current and potential losses at the banks, but that is not the norm. That sort of breathing room is known as regulatory forbearance, essentially a bet by regulators that time will help heal banking troubles. It has worked before. Brad DeLong has some pithy notes on the Geithner plan. Apparently, that screaming CNBC guy likes it (Alexander Hamilton, really?!). [B]anks play a much less central role in providing capital in the U.S. economy. For example, most mortgages are financed through securitized mortgage pools. The same is true of car loans and other types of consumer debt. Large corporations typically obtain short-term capital by selling commercial paper on the market. The Fed and Treasury have taken steps to ensure that this route of obtaining capital is open, which means that the problems of the banks will have less consequence for the U.S. economy than was the case for Japan. Update: See also Joe Nocera, who is pro-nationalization. The need to get over the 60-vote hurdle in the Senate has yielded a compromise stimulus bill that keeps the alternative minimum tax patch (relatively ineffective) added by the Senate, while reducing two effective measures from the House version: aid to states and school construction funding. It is a sad irony that all the rhetoric decrying government waste will result in cuts in services that had already met the test of being decided worthy priorities by state governments. Furthermore, though critics of the original bill posed as defenders of future generations, the reduction in investment in education today will mean a less productive economy in the future. Two major sticking points heading into final negotiations were the increased Medicaid payments to states and nearly $20 billion in school construction funding, both top priorities for House Democrats and the White House. But Collins, in particular, opposed creating a separate federal program for school construction, and the Senate bill she helped negotiate included no school-construction provision. Instead, Senate Republicans agreed to increase a general state fund to $54 billion, a portion of which could be spent rebuilding schools. "We hung tough," Collins said. That's up from $39 billion in the Senate bill, but down from $79 billion, plus $20 billion separately for school construction in the House bill. That's bad for the economy, but Senator Collins knows that such "Hangin' Tough" makes her a winner in Washington - nobody would mistake her for a new kid on the block. But most mainstream economists say the lessons of the Depression, which didn't end until World War II spending kicked in, are different. They say New Deal spending programs instituted by President Franklin D. Roosevelt -- combined with moves to bolster the banking system, loosen monetary policy and end the gold standard -- did help put millions of people back to work. At the same time, they say that federal spending increases under Roosevelt before the war were modest compared with the size of the economy, and not a good test of stimulus spending. Update (2/13): Bruce Bartlett offers an economically and historically literate conservative's interpretation of the lessons of the New Deal. DeLong on "The Keynesian Escape Route"
I predict that both of the two opposed errors of pessimism which now make so much noise in the world will be proved wrong in our own time‑the pessimism of the revolutionaries who think that things are so bad that nothing can save us but violent change, and the pessimism of the reactionaries who consider the balance of our economic and social life so precarious that we must risk no experiments. The Keynesian escape route opened up key ground in the middle between fascist-style regimentation and socialist-style national planning. Keynes argued that the market economy and capitalist order could be salvaged, and salvaged by relatively minor reforms. An activist welfare-state government with a commitment to full employment had the tools to eliminate Great Depressions, and could put economies back onto the road to Utopia. If only governments would reduce interest rates to get private agents or would themselves spend money freely (without raising taxes) in times when total demand was low, and raise interest rates to reduce private spending and themselves raise taxes (without raising spending) in times when total demand was high, then fiuctuations in employment and production could be greatly reduced, and Great Depressions avoided. Belief in this escape route was strongly reinforced by facts. Those countries that had tried it by accident during the Depression--had infiated early, printed money, ensured low interest rates, and run large budget deficits--managed to survive the Depression much more easily than others. World War II provided final proof, were any necessary--"vindication by Mars," as John Kenneth Galbraith calls it. That component of unemployment, called "structural" or "permanent" during the 1930s, that was seemingly-immune to both the self-adjusting forces of the market and the armament of the New Deal vanished entirely in the 1940s as the federal budget deficit approached and then exceeded the levels that had long been recommended by John Maynard Keynes. And the United States fought World War II without reducing civilian consumption: all of U.S. war production came from new capacity or from capacity that stood idle at the end of the 1930s. Because they can and will borrow, new banks will be much more effective in leveraging TARP funds. They will undertake more total lending, bring more trading to financial markets, and do more to limit the depth of the recession. As a result, investing the TARP funds in new banks will do more to help the troubled but potentially viable existing banks than giving funds directly to them. Banks that are not viable, the ones with liabilities that substantially exceed their assets, will lobby vociferously against a return to historical patterns of bank regulation. They will say anything to postpone a looming FDIC takeover. The administration should not listen to threats and pleas from these doomed banks. It does not have to rely on them to get new lending going quickly and on a large scale. New entrants could give us a few good banks. That, plus an FDIC that can do its job, is all we need. Update: A counterargument from Felix Salmon. It was the biggest monthly job loss since the economy tipped into a recession more than a year ago, and it was even worse than most forecasters had been predicting. In addition, the government revised the estimates for previous months to include another 400,000 job losses. For December, the government revised the job loss to 577,000 compared with an initial reading of 524,000. Over all, it said, the nation has lost 3.6 million jobs since it slipped into a recession in December 2007. "This is not a stimulus plan, it's a spending plan," Nebraska's freshman senator, Mike Johanns (R), said Wednesday in a maiden floor speech full of budget-balancing orthodoxy that would have made Herbert Hoover proud. The stimulus bill, he declared, "won't create the promised jobs. It won't activate our economy." Johanns was too busy yesterday to explain this radical departure from standard theory and practice. Where does the senator think the $800 billion will go? Down a rabbit hole? Even if the entire sum were to be stolen by federal employees and spent entirely on fast cars, fancy homes, gambling junkets and fancy clothes, it would still be an $800 billion increase in the demand for goods and services -- a pretty good working definition for economic stimulus. The only question is whether spending it on other things would create more long-term value, which it almost certainly would. Update: See Nick Kristof on one target of the moderates' misplaced "fiscal responsibility" - funding to help prevent state education cuts. Paul Krugman: That bill is our last hope. Stan Collender: No, there is another. One argument against the tax cut provisions in the stimulus bill under consideration in the Senate is that the last one - the spring 2008 tax rebate - was not followed by a significant increase in consumer spending. The right question, however, is how did the rebates affect spending compared to what would have happened in their absence. That is, relative to what we call the "counterfactual" scenario, which is unknown, though we can try to estimate it. For one thing, growth in consumer spending was falling throughout 2007 and 2008. In 2007, it fell sharply between the first and second quarters, was flat from the second to the third, fell from the third to the fourth and then fell again from the fourth quarter of 2007 to the first quarter of 2008. It then rose, albeit not by much, in the second quarter — before plummeting, with a decline of 3.8 percent, in the third quarter. Those numbers seem to suggest that spending would not have risen 1.2 percent in the second quarter without the rebate. The most compelling evidence, though, comes from a chart that we ran in The Times today. It separates consumer spending by those households below the 95th percentile of the income distribution from spending by those in the top 5 percent. 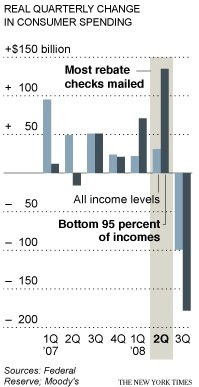 Households in the bottom group generally received the rebate. Households in the top group generally did not. Guess what? Spending by the bottom group spiked in the second quarter. Were it not for a big pullback by the top group, overall spending growth would have been much higher. Speaking of the stimulus, President Obama makes his case in a Washington Post op-ed. What is at work is not only objective, but also subjective uncertainty, or what economists, following Chicago economist Frank Knight’s early 20th-century work, call “Knightian uncertainty”. Objective uncertainty is about what Donald Rumsfeld (in a different context) referred to as the “known unknowns”. Subjective uncertainty is about the “unknown unknowns”. When, as today, the unknown unknowns dominate, and the economic environment is so complex as to appear nearly incomprehensible, the result is extreme prudence, if not outright paralysis, on the part of investors, consumers and firms. And this behaviour, in turn, feeds the crisis. Economists do not, in fact, follow Knight’s work very much. The discipline shys away from his concept of uncertainty (as distinct from risk), because it is, by definition, so hard to model. If economists could model it, then so could firms and investors. The future would be calculable, if not knowable, and there would be less excuse for bewildered inaction. Paul Samuelson once went so far as to argue that economics must surrender its pretensions to science if it cannot assume the economy is “ergodic”, which is a fancy way of saying that Fortune’s wheel will spin tomorrow much as it did today (and that tomorrow's turn of the wheel is independent of today's). To relax that assumption, Mr Samuelson has argued, is to take the subject “out of the realm of science into the realm of genuine history”. Indeed. However, there is an approach known as "robust control" that seems like it could provide a way of incorporating true uncertainty into formal economic models. I haven't read much of this literature, but perhaps it is time to give it a serious look. Nearly eighty years ago, John Maynard Keynes did the math on economic growth and concluded that within a few generations—by the time his peers' great-grandchildren came of age in, say, the 2000's—the persistent economic problem of too-scarce resources and too-few goods would no longer bedevil a substantial portion of humanity. He was right—even in the midst of our current hard times, he is right. The current recession may turn into a small depression, and may push global living standards down by five percent for one or two or (we hope not) five years, but that does not erase the gulf between those of us in the globe's middle and upper classes and all human existence prior to the Industrial Revolution. We have reached the frontier of mass material comfort—where we have enough food that we are not painfully hungry, enough clothing that we are not shiveringly cold, enough shelter that we are not distressingly wet, even enough entertainment that we are not bored. We—at least those lucky enough to be in the global middle and upper classes who still cluster around the North Atlantic—have lots and lots of stuff. Our machines and factories have given us the power to get more and more stuff by getting more and more stuff—a self-perpetuating cycle of consumption. Keynes thought that by today we would have reached a realm of plenty where "We shall once more value ends above means and prefer the good to the useful. We shall honour those who can teach us how to pluck the hour and the day virtuously and well, the delightful people who are capable of taking direct enjoyment in things, the lilies of the field who toil not, neither do they spin." But no dice. I look around, and all I can say is: not yet, not for a long time to come, and perhaps never. I'm convinced that everyone I know can easily imagine how to spend up to three times their current income usefully and productively. (It is only beyond three times your current spending that people judge others' spending as absurd and wasteful.) And everybody I know finds it very difficult to imagine how people can survive on less than one-third of what they spend—never mind that all of our pre-industrial ancestors did so all the time. There is a point at which we say "enough!" to more oat porridge. But all evidence suggests Keynes was wrong: We are simply not built to ever say "enough!" to stuff in general. In the Times, a while back, Bob Frank came to a similar conclusion. The Obama administration's plan, which includes $550 billion in spending and $275 billion in tax cuts, will provide a badly needed "shove" to help get the economy moving in the right direction. Trimming the size of the proposal or shifting the emphasis to tax cuts, as some have called for, would reduce its effectiveness. Tax cuts only work to the extent that households spend them. This is why a broad-based reduction in income taxes would not be very effective as stimulus - many households would save the additional money. The main tax provision in the proposal, a credit of $500 for individuals and $1,000 for couples, will be more effective than a rate cut because more of the benefits go to lower- and middle-income households. Many of these families are struggling to meet their everyday needs, which means they are more likely to spend additional disposable income. The spending elements include investments in transportation infrastructure and schools, improvements to the electricity grid and information technology upgrades for our healthcare system. Some in Washington reflexively attach the word "wasteful" to any government spending, and they have begun to attack the proposal. Those criticisms are irrelevant. For the immediate purpose of boosting economic demand, it doesn't much matter exactly how the money is spent - even "bridges to nowhere" work as fiscal stimulus. The proposals also include federal grants to state governments, which will be a significant, immediate help. Because most states are limited by their constitutions from borrowing, they are forced to cut back when economic downturns reduce tax revenue. We are seeing this already in Ohio. In the absence of federal help, even more cuts in state services will be necessary. While we must take seriously the need to reduce the deficit after the recovery takes hold, limiting the size of the stimulus now for the sake of "fiscal responsibility" would be self-defeating and might prolong the recession. Incidentally, responsibility for the lame headline lies with the editors, not me. They also lopped off this point: "much of the proposed spending addresses longstanding needs and will have economic benefits that outlast the recession." The fundamental psychological law, upon which we are entitled to depend with great confidence both a priori from our knowledge of human nature and from the detailed facts of experience, is that men are disposed, as a rule and on the average, to increase their consumption as their income increases, but not by as much as the increase in their income. This turned out to be one of the weakest parts of the Keynesian edifice, as Modigliani and Brumberg's Life-Cycle Hypothesis and Friedman's Permanent Income Hypothesis showed in the 1950's. However, the modern view that has evolved from Friedman of rational, forward-looking agents choosing their consumption to maximize expected lifetime utility is also a bit hard to swallow. The difference may reflect our research paths. Most of Paul's research has been in international economics, and throughout his career, he could easily ignore equilibrium business cycle theory. By contrast, I have done a lot of work on "new Keynesian economics," which tries to fix the flaws in the Keynesian model that the equilibrium business cycle theorists pointed out. Perhaps that work has given me more appreciation for their contribution, as well as for the defects in the Keynesian worldview. Here is DeLong on Fama, and on Cochrane.